On #DesiRepDiscussions today, we have Enna, who is going to talk about the existing rep in books. What authors got right, what they didn't, what she liked and didn't. So, gear up and have fun! Growing up, Desi representation was something I rarely saw or read in Young Adult novels. No matter how much I loved reading about characters from other cultures and backgrounds, I always felt sad I could never relate to a character myself on that level. And when I did find books that had Desi representation, there were some things I loved about them and some I was really disappointed by. The amount of detail some book had for describing Desi culture! I loved how our traditions and cultural values were expressed and represented for the world to read! Most importantly, I loved when characters need to discuss issues or topics that constantly challenged their beliefs and moral obligations (in regard to their culture); it illustrated how different each character was without taking away from their individuality. The need for diverse books is great, but I wish they did not revolve around overused tropes or stereotypes, like arranged marriages. There is so much potential authors can tap into when writing about Desi culture, but to use tropes and stereotypes as the focus of the book’s plot is disappointing. I would love to see something different. I would love to see Desi characters in more fantasy or sci-fi novels! While there are many contemporary novels and some fantasy novels written by Desi authors which represent Desi culture, it’s rare to find the same in sci-fi novels. I would love to see the same representation across multiple genres. 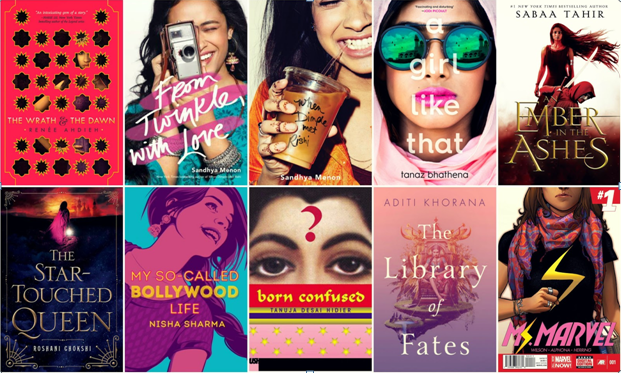 Before you go, here are some of my favorite Desi YA novels written by some amazing Desi authors and a few highly anticipated novels of 2018! Do say hi to Enna ~ she'd love to hear from you!